Their hands were formed for the hilt of a sword, their eyes had seen red blood flow. Demons of night, and unending legions of evil had fallen before them. But tonight, no conflict had prepared them – no sword was sharp enough for this challenge. The three men stood around the ornate brass crib, and stared at each other. One was blonde, with sharp features — he grasped the brass bar tightly and tried to think of anything that would delay the inevitable. The older man straightened his dark sunglasses, and grunted. The final man pushed his long, dark hair out of his face and casually thumped the delicate blue stars that hung above the crib — the mobile spun, emitting a light jingle in protest. “Well, I guess we should…”he began, making an indistinct gesture towards the crib’s occupant. “…should…what?” the blonde man replied. “You know—“the dark haired man continued, repeating the same vague gesture. “No — absolutely not.” the blonde man said firmly. “We have to, it’s our duty.” the dark haired young man insisted. “Is that some kind…of joke?” the blonde man said. The two younger men locked eyes, then shifted their gaze to the older man wearing sunglasses. “Kupo.” the moogle chirped, rolling over onto it’s stomach. The dark haired man shrugged, and pulled off his jacket. The collar was a fluffy mane of white fur. He laid it carefully on the floor, and rolled up his sleeves. “So, you’re going to do it then?” the blonde man said hopefully. “Can’t be too bad – I mean, look how cute they are…probably has cute…you know…” he stopped, his hands hovering over the crib. “I guess.” the blonde man said. The older man, straightened his sunglasses and pointed down into the crib. “Baby’s crying. Our time is now.” he said. The three men leapt – the call of battle overcame all their hesitation. Each burned with a golden light, their eyes gleamed with purpose. The dark haired youth took off the soiled diaper. The older man with sunglasses put on the new diaper. “Kupo!” the infant moogle cooed, hanging on to the older man’s finger. It snuggled in, and quickly fell asleep. The older man pulled his bottle with the other hand, and took a long swallow. He passed it wordlessly to the other men. The other two nodded, and tiptoed quietly from the room. This is the last one you get, so enjoy it. It’s a little frightening how quickly I wrote this. sure sure. just wait until the day where the words no longer flow… you’ll be back… you’ll be back. I like this! 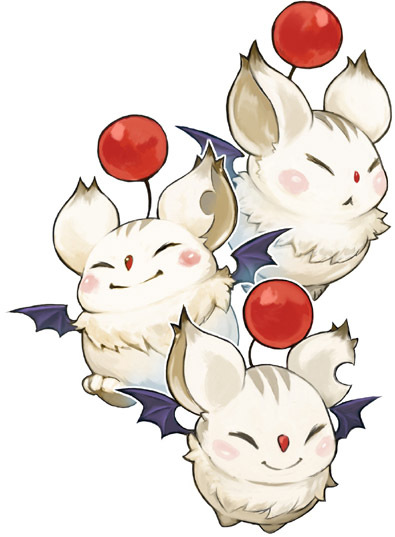 And I LOVE moogles! I remember in FF9 if you called the one with the whistle too much he’d get pissed and say he was sharpening his knife. I have never laughed so hard!! I am both proud and ashamed.